Working with a specific strategic brief to develop an inner city property with scope to retain a character dwelling for long term capital growth, whilst outperforming median rental yields. The key buying criteria centred around the ability to develop a secondary lot for the purpose of building a home to reside in. Location and lifestyle attributes weighed heavily on this brief, including walking distance to Perth CBD, Northbridge entertainment precincts and the Beaufort Street cafe strip. A location with diversity of dwelling types and within close proximity to green space were other key considerations for both liveability and longer term resale. This strict brief, within tightly held locations relied on a combination of search strategies, specifically, intense monitoring of appropriate housing stock and keeping in touch with suitable ‘withdrawn listings’. An approximate 6 month courting period with multiple landowners resulted in an ‘off market’ transaction being negotiated, whereby the now motivated seller accepted a discount on the property price in lieu of selling agent fees, marketing and time. The existing house was leased at $600 per week, with the tenancy remaining in place throughout settlement and subdivision. This income reduced holding costs, with subdivision applications submitted soon after settlement. 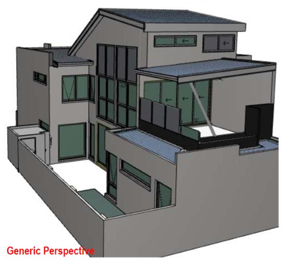 The concept design for the new build on the rear block sought to maximise use of the land (226m2 block) and protect the end value of the finished home, with local government contested to achieve an optimal design outcome, resulting in a 3 bed, 2 bath, 2 garage dwelling over three levels. As the developers are holding, their estimated return is 18% on their initial investment in just 18 months, providing direct equity in their growing investment portfolio.